A trophy-size male torso model shows musculature on one side and surface skin on the other. 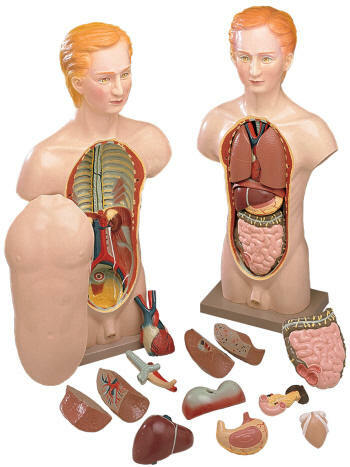 Dissectible into seven parts: torso, lung (2 parts), heart, liver, stomach, intestine. Mounted on a wood base and comes with a key card that identifies 52 labeled structures. 10.5" tall. Both sexes in one torso. 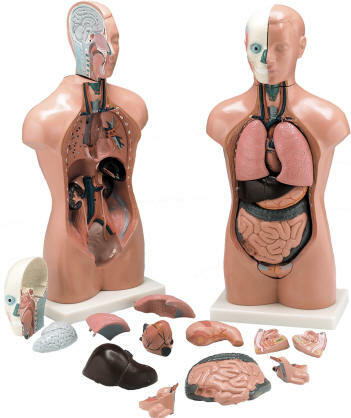 Dissects into 13 parts: 2 part head with removable half brain, 2 lungs, heart, liver, intestines, 2 part female genitalia, 2 part male genitalia and torso on base/ 16 1/2" tall. Sue's boyfriend. 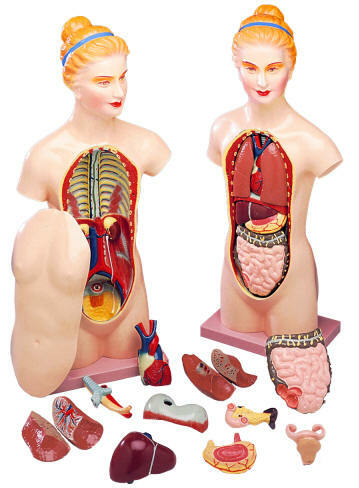 He also has a removable breast cover that reveals 14 dissectible parts - the same ones as Sue but rather than a bladder and uterus, he has bladder and prostrate. Just like Sue, he's mounted on a stand and comes with a key card with 71 structures. labeled. 18.5" tall. 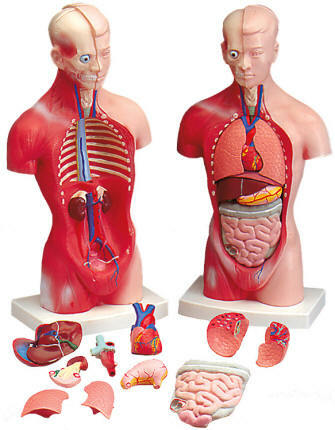 This little masterpiece is half life-size so even small hands can easily disassemble the torso. All parts are numbered and identified on the included product manual. 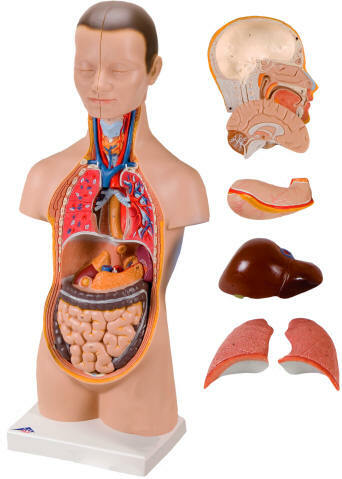 Removable parts include: 2 head halves, brain half, 2 lungs, 2 part heart, liver with gall bladder, stomach and 2 part intestinal track.